This post is made because I want to share my happiness of having Sunday Mass with my best friend, Edwin Adrianta Surijah. 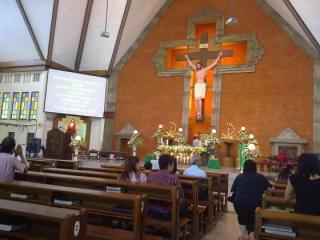 I told him a few weeks ago that I want to have International Sunday Mass at Redemptor Church, Jl. Dukuh Kupang Barat I/7 Surabaya. And, finally we made it today! After a number of wrong turns, asked around and no one really knew where exactly the church was, we made it! Personally, I felt happy because it’s been sometimes since the last time I attend International Sunday Mass, in which delivered in English. The songs, the atmosphere and the homily were different and I loved it. Edwin told me that the songs used for mass were not his style at all. He’s into liturgical Catholic songs which we used every Sunday during mass. The point delivered by Fr Noel was short, but straight to the point. He explained the Gospel Luke 9:51-62, in which Jesus ask His disciples and followers to follow Him 100%. If we still doubting our faith and still asking around about what to do as Jesus’ followers, then we may not be eligible to be called as His disciples. Everything that disciples do must glorify Jesus’ name, and not their own. Will you be agree? We can’t be agree more … Can we? Happy Sunday, everyone! And be faithful, because Jesus is faithful and He had loved us first. Writing is my way to share it to you. …and you forget to mention, the photo credit is on courtesy by Edwin Adrianta Surijah….. So, if you’re a teacher, be 100%. If you’re a husband, be 100%. If you’re a mother, be 100%. That’s the way of give thanks back to the Lord. One way to be “100%” is by not playing around with the fire (“jangan bermain api”). I’m learning a lot as a partner, I should be 100% giving all my best to my lover and not messing around with the fire. Thank you Father Noel for the jokes and the enlightment. Really such a great mass.